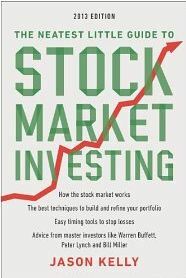 The Neatest Little Guide To Stock Market Investing Review | Doris S. Michaels Literary Agency, Inc.
Jason Kelly sent me an updated version of his book, The Neatest Little Guide to Stock Market Investing: 2013 Edition *, to read and review. I finished reading it yesterday. It’s a short read, which is good because I’m a notoriously slow reader. Overall, I liked the book and would recommend it to anyone just starting out on the road to investing. Jason covers most of the basics from defining what stocks are, how to open a brokerage account, how to buy and sell, and he even spends a good portion of the book offering tips from some of the well-known investors like Warren Buffett and Bill Miller (along with a few others).